A ride to the doctor’s. A taxi bus (the blue license plate is for vehicles transporting people). It is always disappointing that professional drivers are actually the worst drivers. Although the van does not get into my counterflow lane it does come so close that I have to get to the kerb more. Overtaking the woman so close is also not very nice. A few seconds wait is too much for taxi drivers, that seems to be universal. The woman driving this car did wait decently with her turn into my path. Here I am about to cross the new Barten bridge. 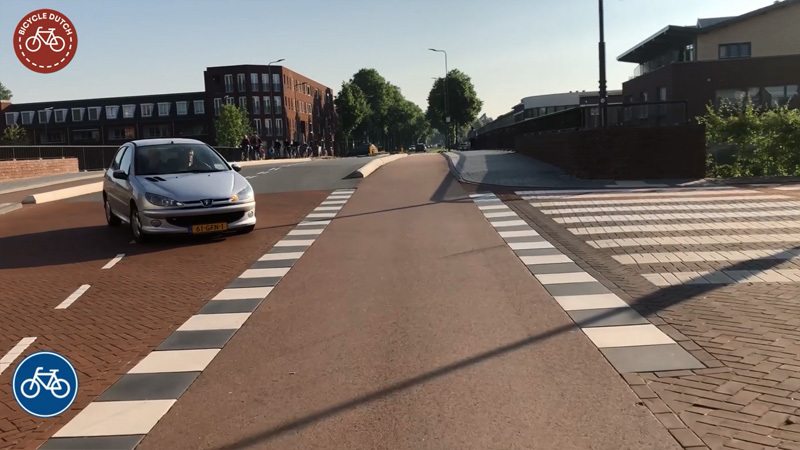 Note how the blocks to mark the edge of the cycle crossing are on the outside of the crossing. This makes the crossing optically wider. This is according to the latest design recommendations. This reconstructed intersection was also the topic of one of my more recent posts. On this side I pass the minor side street (to the right). It is very clear who has priority here. This service street was upgraded in 2009. The topic of one of my first videos. I explained the phenomenon of the service street with this very street as an example in an older post. It was also the topic of a People for Bikes post now. Where the service street is crossed by a major collector road, the city built a typical protected intersection. Since I turn right here I do not have to pay attention to the signals. I can just cycle past the lights. The major road has uni-directional cycleways on either side. 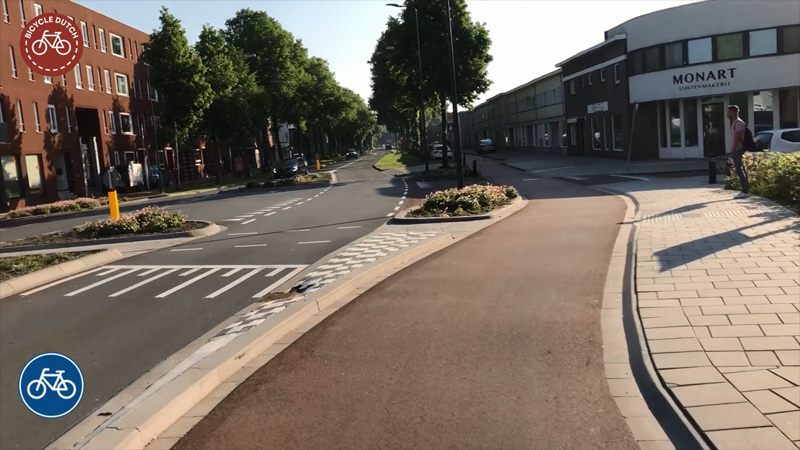 This is a very traditional street lay-out that is more and more replaced by bi-directional cycleways. But here it still works well. This roundabout in a 30km/h zone is very unusual. 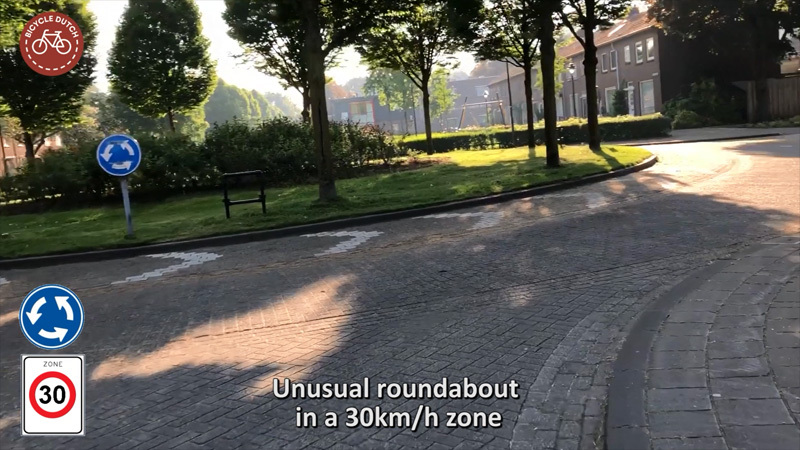 The roundabout was already constructed when the blanket speed limit in the built-up area in the Netherlands was still 50km/h. In a 30km/h zone a roundabout is normally unnecessary. My bike parked in front of the community health-centre. Many other visitors also came by bicycle. The centre is home to general practitioners, physiotherapists, pediatricians, there is pregnancy care, a blood draw lab, etc. The ride on a map. I go to the same place to see my doctor (not necessarily the same doctor, there are 3 or 4 there with a shard practice). Dit is, naar mijn mening, onterecht zeuren Mark. 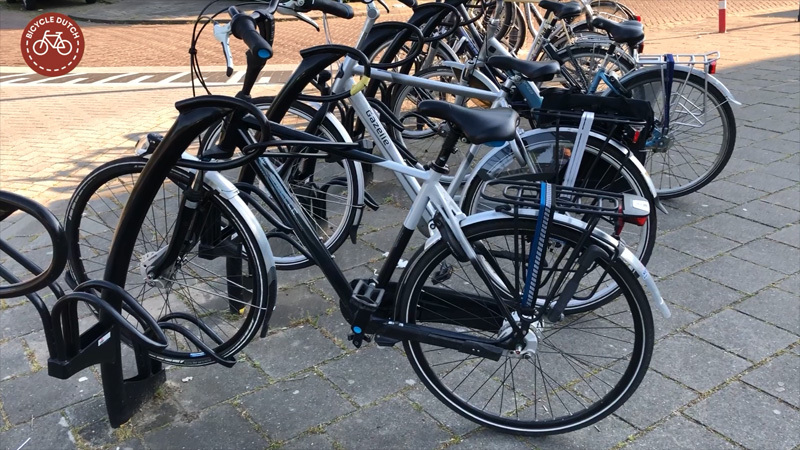 De afstand tussen banden-fiets en banden-taxi is al gauw 1.2 meter, en de taxi zit met zijn spiegels boven de markering-fietspad, zo hoort het toch ? Ook de snelheid van de taxi is heel passend. 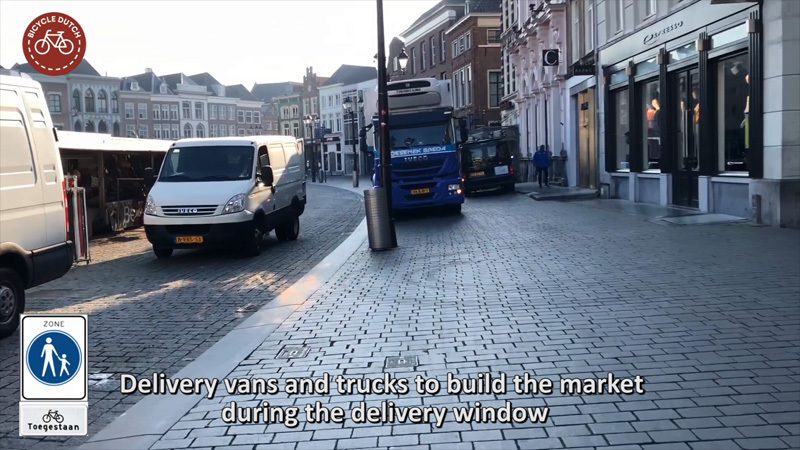 Deelnemen aan het verkeer is ‘samenwerken’. Ik zie geen enkele reden om daar een negatieve opmerking over te maken. Very helpful guidance on the rules of the road. 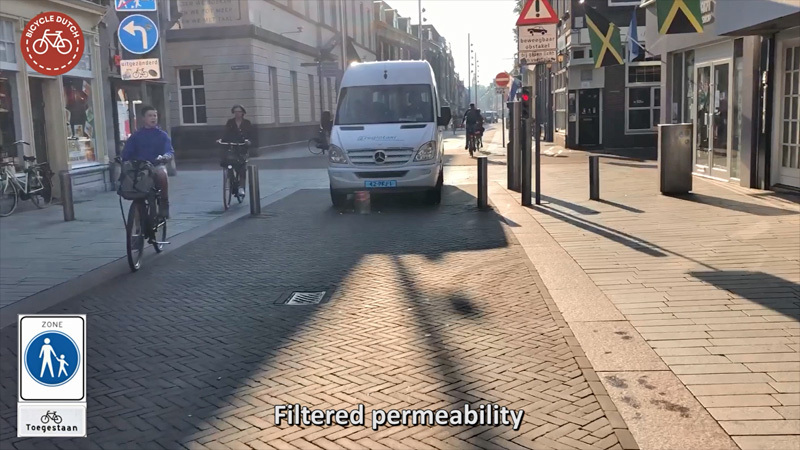 Hi Mark, while I noticed that lots of the metal grates in the footpath and roadway you travelled on for this ‘Doctor visit’ ride are on the diagonal, I also saw quite a few that seemed in-line with the direction of travel. Is any thought given to this or to associated hazards? I’m not suggesting otherwise – just interested. It’s a recurring problem here in Adelaide where grates are removed for inspection etc then often replaced with the (often large) gaps in line with the roadway’s direction of travel! Maybe our drain grate are bigger than yours – nevertheless interested in any comment you may have. regards, Sam. So downtown there is a pedestrian zone and after that a 30km/h zone with no traffic allowed to go in. 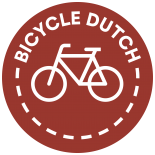 Both zones with an exception for bicycles. Do these exclude the ‘snorfiets’? Or would that require an extra specification? I saw one parked at 1’42 and one coming from the left at 1’52. When you left the zone at 2’46 I saw a few them parked and you were driving behind one. Which then drove into another zone with a similar ‘except bikes’ sign. In that street there is one parked at 3’13. At 3’36 there is a motorbike parked, which falls in the category of cars. All together just a handful! What is happening there? Or is it not allowed to park them downtown? The other one way traffic roads are the usual at which (snor)fietsen are allowed to go both ways. So it’s no wonder that the bikes and cycles are parked everywhere. The motorbike next to the bicycle parking is just a space saver. Thanks Peter! And I also had to grin about the lovely couple on a ‘snorfiets’ driving right next to the sign saying they are not supposed to drive there. Pretty much sums it up. The problem is national, not only in Amsterdam. But at least the pedestrian zones are a way to fight them! 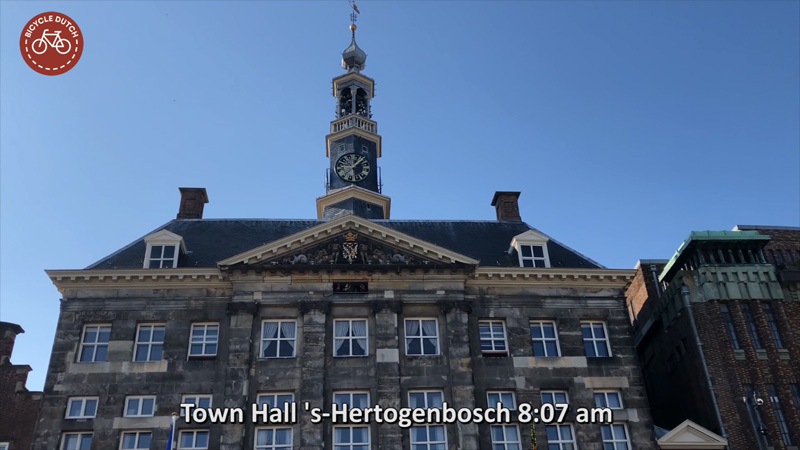 Now, let’s see if the new coalition with the greens in Amsterdam is going to make a pedestrian zone of the old city centre (with bicycles as guests). There is already a way to fight them, without the need for more legislation. If you replace the signs G11 with G13, they are banned to the main road by default. It just means that cyclists are also allowed to ride in the road, unless they also place a sign C14 there. But the latter would mean they have to have to make the paths wide enough for 1,5m wide (tri / quad) cycles. The latter are allowed on the main road if wider than 0,75m regardless of sign G11 or G12a. The other part in fighting them is more speed checks. About 96% of them drive faster than legally allowed. The chance you get fined for that right now is not even once per year. Starting this year there is also a ban on importing or producing new 2-stroke ones; a ban that should have been there 10 years ago. 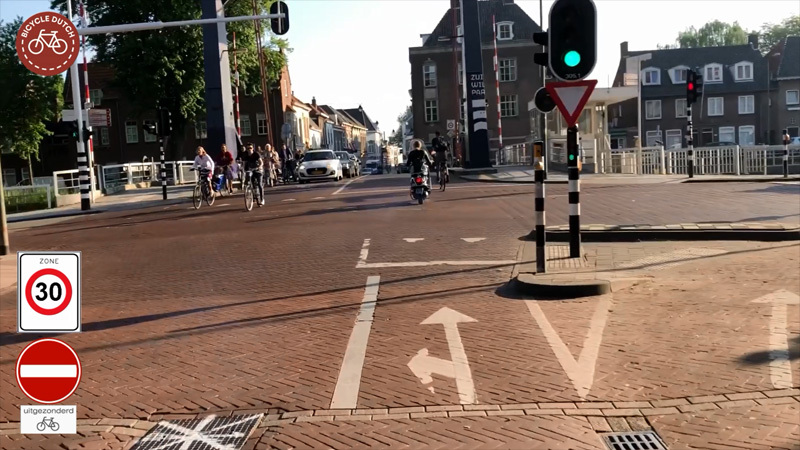 The basic rule is that on a crossing with a road that has the same level of priority, cyclist from the right have priority like all other drivers. 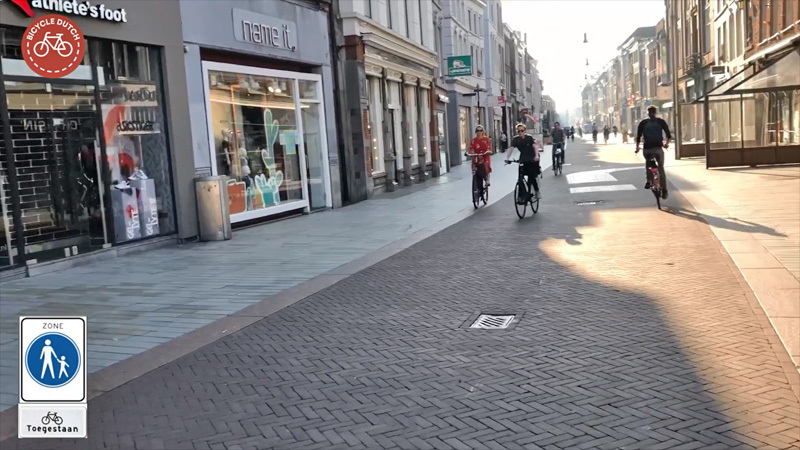 In the video the first cyclist you see comes from the pavement which does not have the same priority. later on a cyclist from the right has priority but has to wait for a car coming from her right, so Mark could take advantage of the situation and cross at the same time as the car. 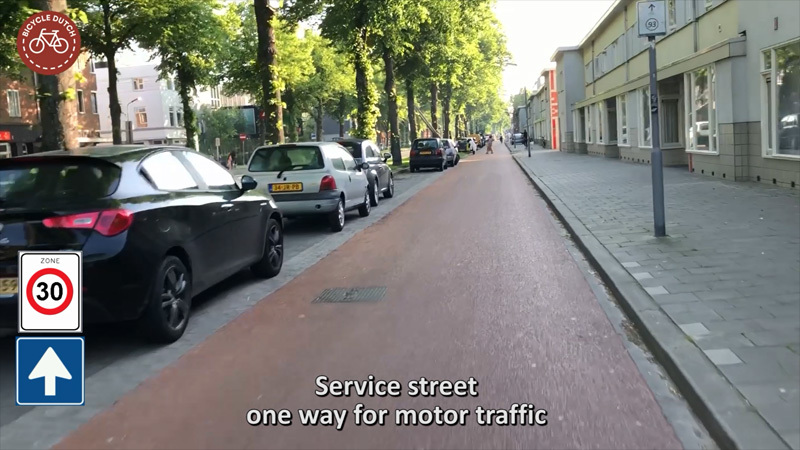 I have a question about the IMO quirky give-way-to-the-right rule in the NL; in the video at around 2:55 and 3:10 there are cyclists entering the street from the right from streets that don’t appear to have the dragon teeth, so legally would you have to give way to them? In parctice it seems this rule isn’t what happens and most people entering from the right will give way. 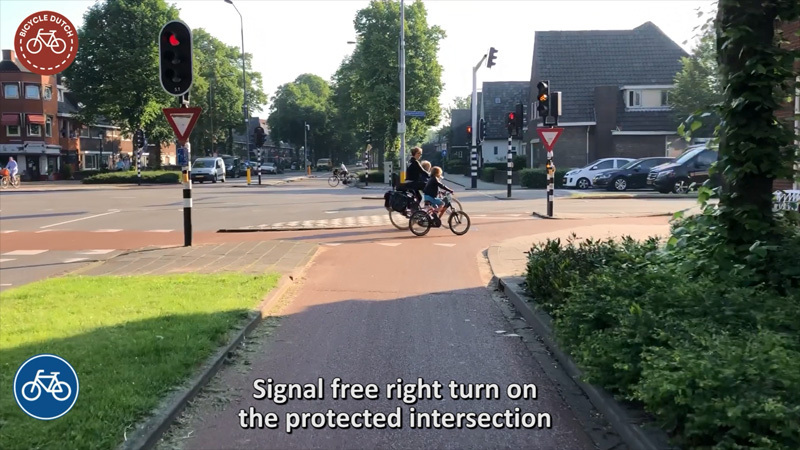 A bit like the pragmatic way pedestrians and cyclists negotiate the zebra crossings on cyclepaths in Amsterdam. 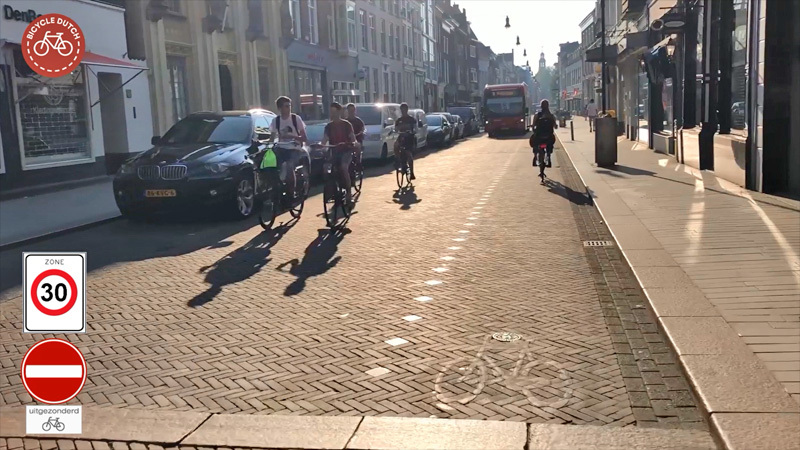 A little bit further on you seem to get cut off by two cyclists from the right who should have given way to you, but it doesn’t really affect your speed as the cyclepath is wide enough to pass two cyclists riding abreast, even on a bridge where street width is at a premium. I hope you have time to provide an answer. My apologies if you’ve already explained why the give way to the right rule in a previous blogpost but I can’t recall reading an explanation for it anywhere. Yes, but since the other direction doesn’t have to they can’t cross either way and opt to wait until traffic from their right has an opening. Not all streets from the right have priority, even if they don’t have the dragon teeth. They might be designed as an exit. This is an ongoing confusion. The courts have improved it somewhat. E.g. 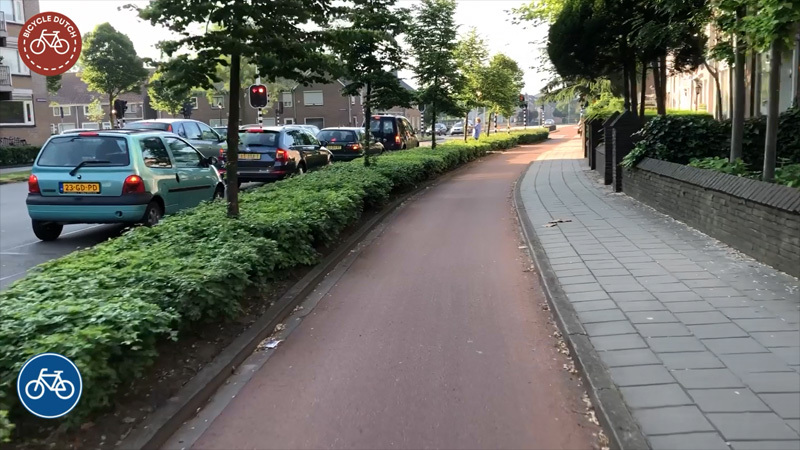 ; if the road surface of cycle paths and sidewalk continues and there are sharp corners instead of bends; it’s an exit; no priority. 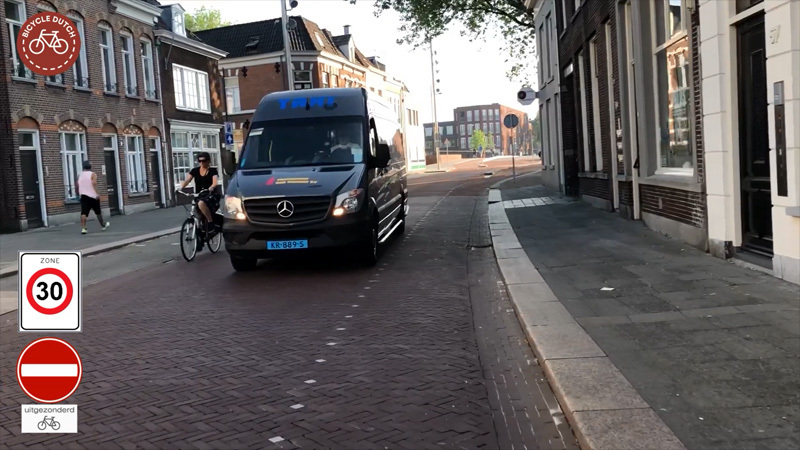 This entry was posted on 19 June 2018 by Bicycle Dutch in Original posts and tagged ’s-Hertogenbosch (Den Bosch), ride, service street.